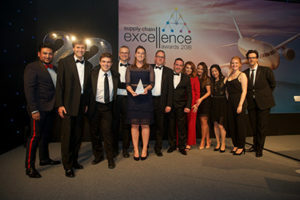 Some of the most exciting developments in logistics have come from the development of online shopping, and the Supply Chain Excellence Award for Retail Innovation went to a system designed to optimise inbound capacity by Ocado working with its logistics partner PW Gates. It fought off strong competition from Sainsbury’s Retail with Asset Solution and Entopy; Debenhams with Doddle; and Tourvest with Relex Solutions. The Ocado initiative has enabled the retailer to continue to extend its range while reducing costs for its small suppliers. The judges were impressed by the significant benefits that resulted from the project – improved cash flow for Ocado, its vendors and its haulier through better inventory management, reduced invoice discrepancies, and increased stock accuracy. What’s more, turnaround time was reduced by 20 per cent and inbound capacity was increased substantially. Innovation was a key theme of the Awards this year and highlighted the dramatic developments in both supply chain thinking and technology that is changing the market.